Urban Horse Promotes a Clipping Naturally Parelli Natural Horsemanship DVD by Pat Parelli. 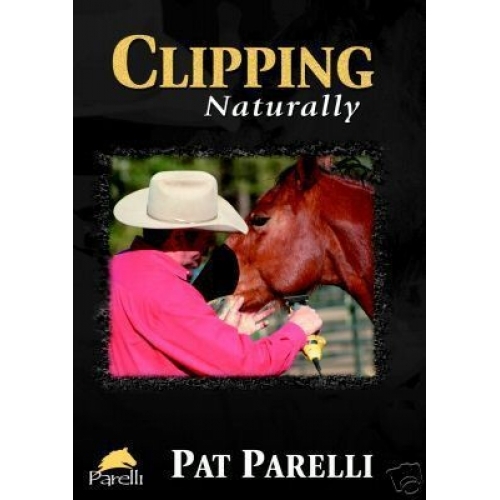 Clipping Naturally DVD - All Horse Lovers Must View This DVD! Is it possible to convince a horse that "anything that buzzes and tickles can feel good"? Pat Parelli has created a unique preparation program designed to help you help your horse to LOVE being clipped! Clipper Savvy (5min.) Pat discusses the sizes of clippers he uses, as well as useful tips for preparation and maintenance of your clipping tools. Horse Preparation (20min.) Pat introduces Allure, Linda Parelli's high-spirited young Warmblood, and explains his preparation program for clipping with confidence. Allure's Prep & Clip (89min.) Watch Linda Parelli and Allure do their preparation "homework", and how they approach their first clipping session with Pat. Q&A (22min.) "Should you tie a horse up to clip him?" Pat answers this and more questions regarding clipping. Natural Winter Clip (26min.) Pat shows how he would clip one of his horses to tidy up those winter fuzzes. Seven Games Bonus (38min.) Pat gives an overview of how he uses his 'Seven Games' to prepare a horse for clipping.